To see photos from Menfluential 2018, click here. As the new year begins I get excited like a kid in a candy store, anticipating a conference that brings together men (and women) from all walks of life to better themselves in the areas of style, fitness, grooming and business. 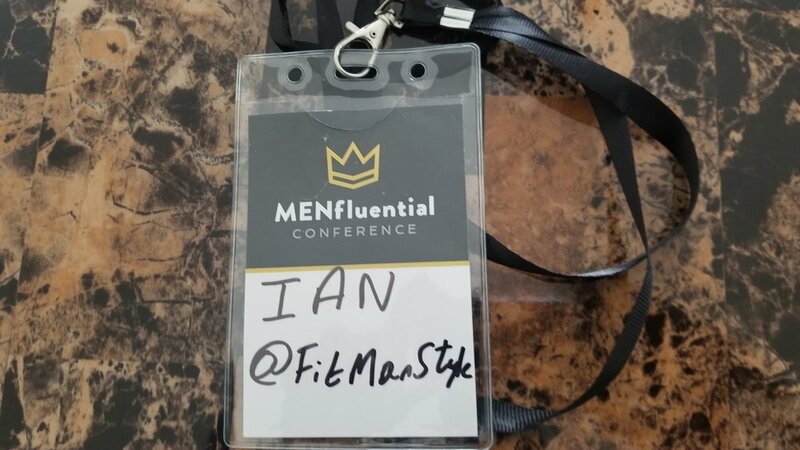 Menfluential, formerly known as Stylecon, was created and hosted by Antonio Centeno from Real Men Real Style and Aaron Marino from Alpha M five years ago that has evolved into something bigger than its humble beginnings. This is my 3rd year attending and I had a blast! If yall recall last year, I did a post on Stylecon but this time around I want to do something different. I'm not being paid to do this but I do feel this conference will bring alot of value to anyone on the fence about it so here are my top 10 reasons to attend Menfluential 2019. I came across Antonio's videos back in 2012. With him being a Marine and my brother being one as well, I figured he might be alright. I ended up loving his channel and style advice. Naturally I was introduced to Aaron through Antonio and I found his content to be different and entertaining, tackling topics others wouldn't touch like manscaping. When we watch these youtube stars, we tend to put a celebrity-like aura on them so to have an event like this where you can meet them, shake their hands, take selfies with them you realize they are just regular folks with a camera in front of them. I wanted to meet the man who inspired me to start blogging, both gentlemen are stand up guys. Antonio and Aaron give us quite a treat for two days. The speakers and panelists are some of your favorite style youtubers, instagrammers, influencers, business owners and just a who's who in the style, grooming, business, fitness space. Any speaker that goes up has the crowd jotting notes from Dan Lok, Tanner Guzy, Brock McGoff, Ryan Magin, Alex Costa and the best part? Once they get off stage, just like the hosts, you can pull them aside and talk to them, take pictures even grab a drink with them during the socializing hours. Again, these are regular folks like you and I who took a chance on their careers. Having met alot of fellas I follow on social media, I can definitely say these guys are as personable as they come. Along with the hosts and speakers, you meet like minded men (and women) you can talk to and build long term relationships with. On my first trip in 2016, I knew nobody, and I mean N-O-B-O-D-Y! I took a chance flying to Atlanta to meet total strangers not knowing how receptive they would be and I felt welcomed. Since that first trip, I have developed and maintained friendships that I wouldn't have otherwise and going back is reminiscent to an annual family reunion. Friendships are made, business cards are exchanged, partnerships are formed, that type of human connection you can't get through the internet and can't put a price on it. From what I was told, the first event had no more than 20 guys show up. By my first attendance in 2016, it was almost 200. Second attendance, almost 300. Third and most recent attendance, 400. From this point on, it will be capped at 400 and there's a couple reasons for that. 1) The Ambient studio where the event has been held for the last five years can't hold more than 400 people so for safety and fire code reasons there has to be a limit. 2) The event being so small is the reason you can do the first three aforementioned reasons on why you should attend. If the event got any bigger, you probably won't have a chance to meet and greet everyone. You know those brands Antonio, Aaron and pretty much every youtuber (including myself) talks about like Tiege Hanley, Anson Belt, and Ribbed Tee? Well, you not only get to see these products in person, but you also get to meet the founders of theses brands as well. There's a good chance they are one of the speakers or on one of the many panels. Again, personable folks you can talk to with ease. If you have a business in mind and don't know where to start, these are the people to talk to. Most likely they have the answers to you questions. And who doesn't love free gifts? Over the years Antonio is known to get on the mic in between presentations and just ask "who wants _____?" and gives it away to one lucky attendee. The sponsors that show up often give exclusive discounts to those at the conference as well. But this year they out did themselves. Antonio and Aaron gave out 100 pairs of Paul Evan shoes on a first come first serve basis (I missed out on my size), Anson Belt left tokens in obscure places that once found earns you a free belt, Jeremy Fragrance gave out free cologne, and other small business that showed up gave out their products for free to promote themselves which is all good. You are certain to leave the conference with more than you came with. The last couple years, we always meet up the Thursday night before at the Sky Lounge at the Glenn Hotel as an informal meet and greet. This year however, there were a couple meetups put together by the influencers/speakers that gave you a chance to meet them before the conference in a very casual environment. I suspect this will continue in the years to come. After the conference, there is also a social hour at the ambient studio that also allows you to loosen the tie, relax, grab a beer and just talk. This is were relationships are formed. In the words of one of this generation's most astute poet Christopher 'ludacris' Bridges, "Welcome to Atlanta where the playas play...........and parties don't stop til 6 in the morning!". Atlanta is such a beautiful city so much so I stayed an extra day after the conference was over to just BE in the A. Rich with tradition, history and southern hospitality, I had second thoughts about coming back up to New England. I absolutely love that place. The people are nice, the food would knock your socks off, there are so many things to see and do I find it hard to believe that someone can stay in Atlanta and be bored. CNN center, Coca Cola Museum, Falcons Stadium, Phipps Plaza, Lennox Mall, I needed more than a day to explore Atlanta. I'll be back. They provide breakfast finger food at the event which is well appreciated and recently there have been a welcomed addition of food trucks. That wasn't the case my first time there, I believe I had to fend for myself. One thing I like about the founders of this event is they ask attendees what they can improve, lunch was surely an area that kept getting brought up. Up to four food trucks of different cuisines were brought and it can tempt you to go for seconds or thirds but trust me, that first round might just give you the itis. Food makes everyone happy. All attendees and alumni of this event get early bird, deeply discounted tickets for the next year. These are usually released a couple days after the event and they sell out quick! This is a great incentive to come back, prices usually double after they are sold out. For all you're getting, this is more than a steal. It's highway robbery. I heard about Anson belt last year when I attended Stylecon 2016, a men's conference started by two major style youtubers Antonio Centeno and Aaron Merino. DISCLAIMER: I'm not part of the military. I come from a military family with my two older brothers in The Marines and Army and cousins in various branches as well.